join the sweetest team around! FruitBouquets.com℠ was launched by 1-800-Flowers.com® in 2011, marking our entry into a rapidly growing market for Same Day fresh fruit arrangements and direct ship chocolate-covered strawberries for every occasion. To meet the growing consumer demand for these truly original products and capitalize on the opportunity to expand further into a new and exciting business venture, we’re pleased to invite all qualified prospects to apply to become a FruitBouquets.com℠ fulfiller. Leverage the national marketing reach of 1-800-Flowers.com®, a leading brand in consumer gifting. Enjoy a low cost of entry and revenue growth opportunity. Join this exciting program now and become a part of its growth-don’t miss out! 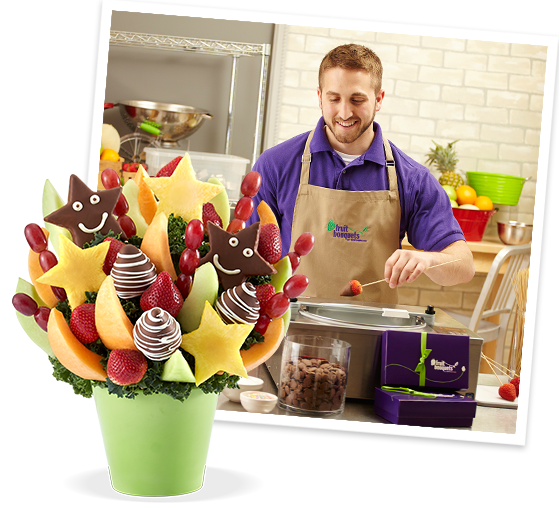 Join the FruitBouquets.com℠ family and start receiving orders for fulfillment today! See What our Shops/Fulfillers Are Saying! "We have been running a family-owned fruit arrangements business for six years and sales were stagnant. Joining the Fruit Bouquets family increased our sales, leveraged our business and we can finally compete with our big competitor. We did all this with minimum investment and with the help of the excellent support team at FruitBouquets.com℠." "I decided to team up with 1-800-Flowers.com® to fulfil orders for their new FruitBouquets.com℠ brand this past January (2015). After nine months of working with the FruitBouquets.com℠ brand, I am so happy to say that this was one of the best business decisions I have made! The synergy created by embracing a new product line that shares the resources already in place has been a profitable investment for me. With a low cost of entry, exceptional training and support, and a strong demand for our product, we have easily incorporated fruit arrangements into our operation."